On May 10th, 2009 our world changed forever. We woke up that morning happy, excited to see what the day would bring. For me it was special because it was Mother’s Day, and the kids treated me like it was my birthday. Joe had to work the day shift, but would be home in time for dinner. God gave me four beautiful children. He knew exactly what he was doing when he placed each one in my arms, in the order that they came. I was very young when I had John, then only 11 months later Jenny made her arrival. Then I stopped, for over 20 years. John and Jenny were the perfect kids for me when I was young. I didn’t really know what I was doing, I was a teen mom. But, by the grace of God, and my own Mom’s help, we made it through, and had fun. I’m blessed to say they are both parents of their own, and I couldn’t be more proud of them. When we had Tony, I admit, being a lot older this time around, I really appreciated everything more, from my pregnancy, to the miracle of his delivery. We had four wonderful years with Tony before Joey came along. After Joey’s birth, our family felt complete. God gave us this little miracle, my fourth child, my 3rd son. God had a hand in his diagnosis day as well. In my previous post I explain why I think it was nothing short of a miracle the way the the sequence of events happened. Anyway, now its four years later. I’d like to share with you how we felt the day he was diagnosed, and what’s happened since. On the day we found his blood sugar to be 466, we panicked. We didn’t cry right away, because I think we were in shock. Truly, shock. How can this be that Joey has type 1,our grandson Cooper has type 1, we can’t have this happen to our family again. I would later find out that there are a lot of multiple children in families with type 1 diabetes. The next few days would be a blur. After our pediatrician appointment at 9:00 am on the 11th, we were in touch with the Endo department at Children’s Hospital of WI. On Tuesday, May 12th, we were in class from 8:00 am-1:00 pm, and we’d given our son his first shot of insulin. We returned to CHW the next morning, and by Wednesday afternoon, Joey was back at school, he didn’t want to miss his spring concert performance. We considered ourselves to be blessed that we weren’t in the ICU with a child in DKA. But, we were new to type 1 diabetes in the sense that our son is now 100% reliant on our ability to keep him alive. When our grandson Cooper was diagnosed, we were confident in our daughter and son in-law. We knew that they could handle this and Cooper was in good hands. I didn’t feel the same way about us, well, about me. Joe was fantastic, he wasn’t afraid like I was. I kept thinking, what if I mess up? I could kill my son with the wrong amount of insulin. I was scared to death, and I cried a lot. I’d be driving down the road, and the water works would start. I probably cried for an entire year. I still get choked up when I see Joey telling someone about type 1, I’m so proud of what he is doing for the disease, and how well he is handling it. There is so much to learn about type 1, more than I ever knew. I went through a period of guilt. My grandson was diagnosed in 2006 and although I went to the same classes with them that I went to with Joey, I still didn’t understand it. Not until you have to live with it, do you really understand it. I will proudly say that over the past four years, we have learned a lot, we have shared a lot by writing blogs about our lives with type 1, we’ve done a lot in terms of raising money for research for a cure, and spreading awareness. Joey has been named the 2013 ADA Youth Ambassador, he has gone in front of law makers telling of his life and challenges with the disease. We couldn’t be more proud of our 3rd son. He is making such an impact on so many lives. We’ve met wonderful people that we would never have never met before, new friendships that will last a lifetime. 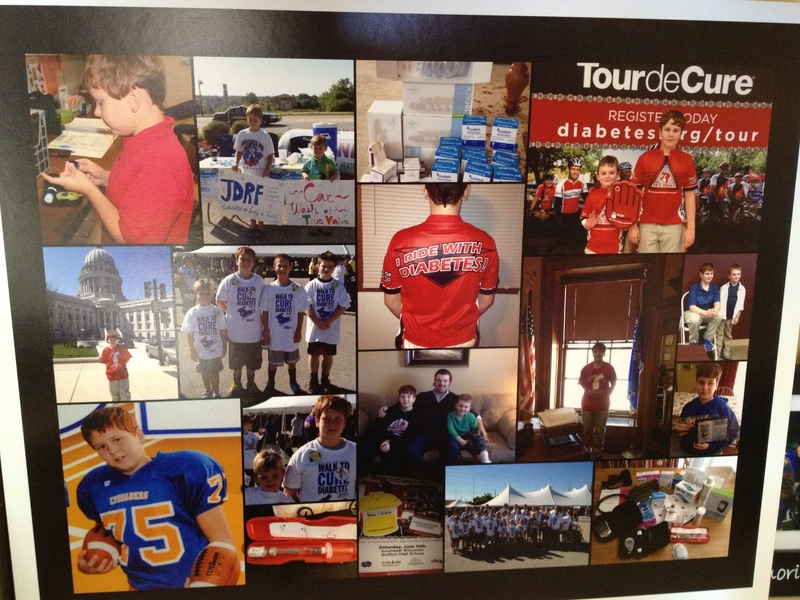 As we approach the 4th anniversary of Joey’s diagnosis, or as they say in the D-World, his Diaversary, we can be proud of what he has accomplished, and pray that the next 4 years bring even more exciting opportunities for Joey, and maybe even a cure, it would be nice to celebrate an anniversary of the CURE for type 1 diabetes. Previous Post Looking back at our son’s d-day, diagnosis for a disease without a cure.